Home > Skincare > Beauty Hacks. Why do I keep hot pepper in my makeup bag? Each set of kitchen seasoning should contain hot pepper that can add this extra flavour to almost every dish. But what have in common hot pepper and cosmetology? Contrary to appearances, a lot! I don’t take out a sachet of dried hot pepper out of my makeup bag. I’ve decided, this seasoning stays there for good. Why? For the start, a few words about hot pepper’s properties. The most considerable advantage of this seasoning is the fact that it is incredibly rich in anti-oxidants as well as A and C vitamins. Yet, it is not everything that is so astonishing about this edible red powder. Its spiciness is due to a substance called capsaicin, the working of which, can be described as painkilling and anti-inflammatory. As it is not hard to guess, the more spicy a pepper is, the greater concentration of capsaicin it has (which results in its better working). What is more, capsaicin significantly improves burning of calories, facilitates the oxidation of fats, slows down appetite, strengthens organism and eliminates development of new fatty cells. Personally, I don’t use hot pepper for slimming-down properties. Fortunately, I don’t need to loose weight 😉 . 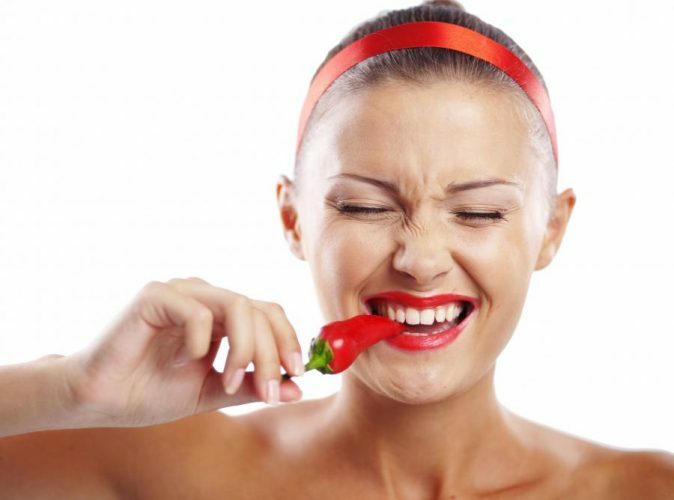 For me, hot pepper is more valuable as a source of anti-oxidants and vitamin complex. As it is widely known, anti-oxidants are allies in the fight against free radicals that are responsible for collagen breakdown in skin. And without collagen, our skin becomes less elastic and more prone to wrinkles. Maybe there are people who think that fine lines are cute signs of ageing but definitely I don’t share their enthusiasm about this issue. For that reason, I apply Hell Face Mask regularly. I named it this way because it is really spicy! How to prepare Hell Face Mask? A half of a teaspoon of powdered hot chili pepper, a teaspoon of honey and a small quantity of avocado (best, if the fruit is soft, easy to mash with a fork) are the three basic ingredients of my beloved homemade face mask. When all the ingredients are mixed, I apply the mask on cleansed face, omitting eye skin area. I leave it on for more or less fifteen minutes. Do not wear Hell Face Mask too long because you can harm your skin fairly considerably. Every time, when I rinse off the mask, I apply a deeply moisturizing face cream or other oil which is responsible for providing hydration to skin.